and keep for themselves the profit that I and other middlemen make. In October 2001 I was able to take a first step in that direction, and I added more pieces in the spring and fall of 2002. 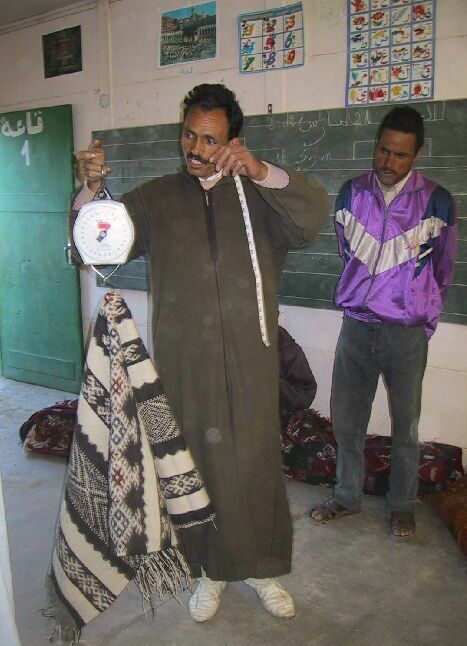 Eventually I would like to work in several areas of Morocco, each with a different weaving style. I began in southern Morocco, where they make at least five kinds of rugs. 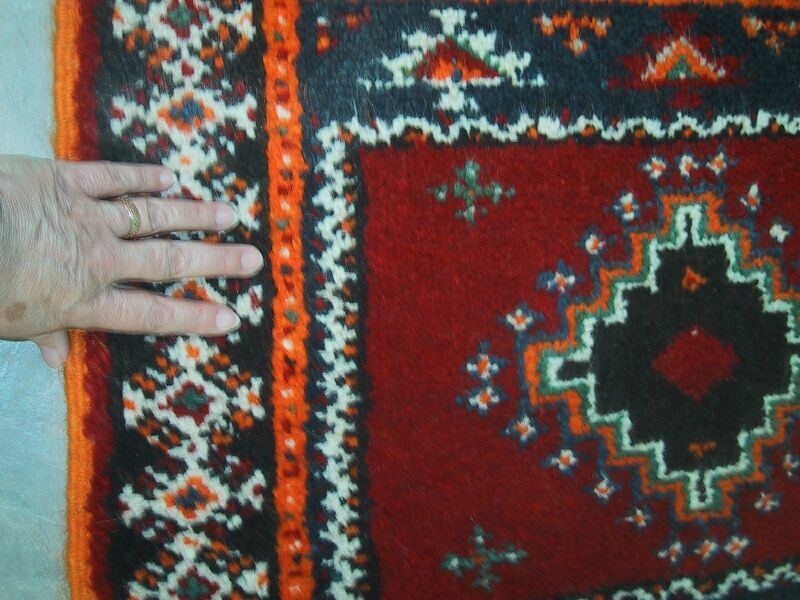 You can see rugs, the women who wove them, and learn a bit about their families below. If you buy a rug, you can print out the weaver's photo and family situation, and display them near your rug as a reminder of just where it came from. 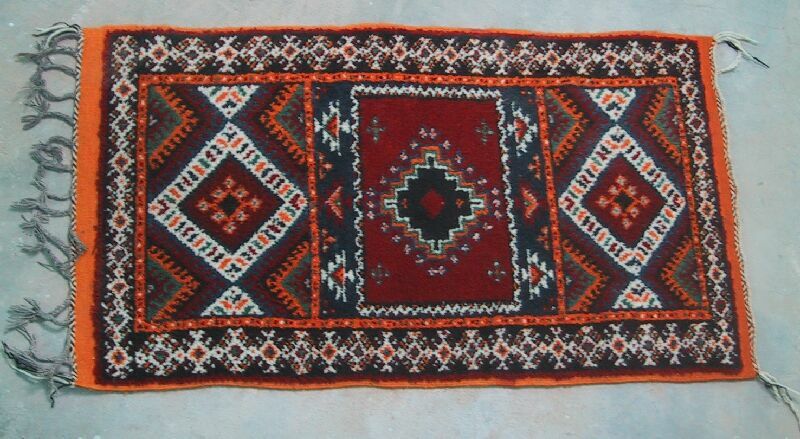 These rugs are now in the weavers' homes in Morocco. You order them through me, and I contact Morocco and send them the money. Because of recent fluctuations in the dollar-Moroccan dirham exchange rate, prices may vary a bit from those here. Although such a change is not very likely, if that is the case I will let you know when you ask about a particular piece. If I don't mention it, the price is unchanged. Insurance and airmail shipping from Morocco to the US are included in the prices, and delivery will take about 3-6 weeks. Other locations may vary in time and price, and you can email me to ask about them. This is the village of N'kob. 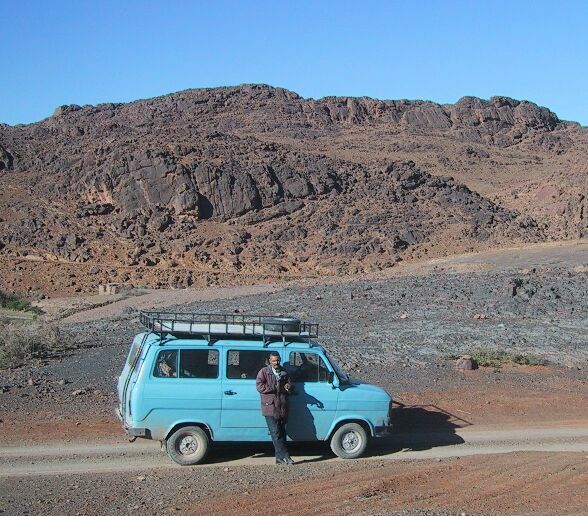 It is south of Ouarzazate and north of Tazenakht in the High Atlas Mountains. The full name of the village is N'kob Ait Ourghrda, population 670, and the women there are renowned as some of the best weavers in southern Morocco. 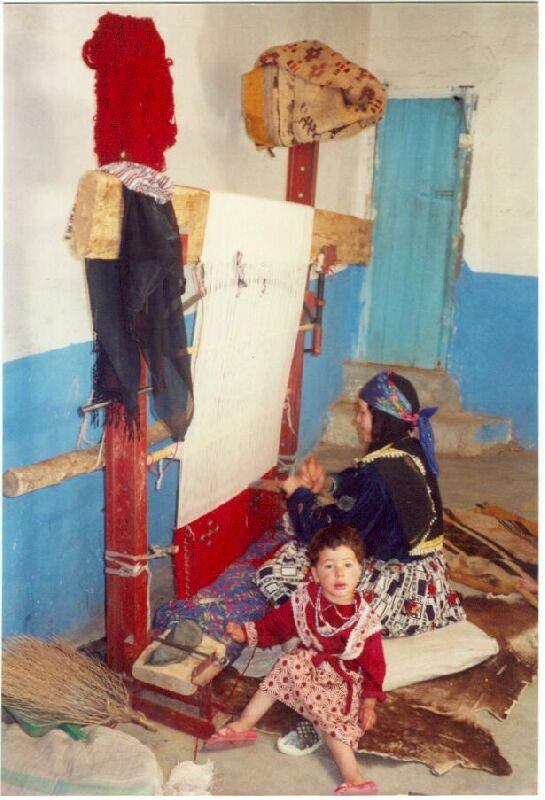 This is a weaver in N'kob, being "helped" by her neighbor's daughter. To see the photo larger, click on it. You can see the loom better and how the part of the rug she has finished is wrapped in a cloth at the bottom to keep it clean. She's using a heavy metal instrument to push the yarn tighter. I began this work with the help of the Near East Foundation, an American community development organization that has been working with rural women in Southern Morocco since 1987. A diverse set of programs in health, education, leadership, income generation and management help women gain a sense of confidence while increasing their incomes and improving the standard of living of their families. 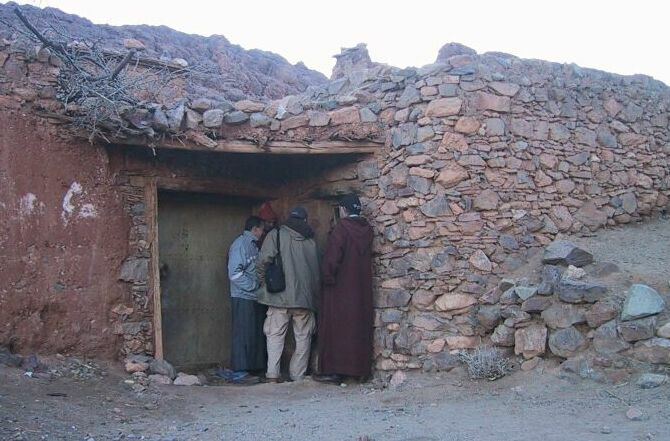 A Berber-speaking team of women and men is working in N'kob with the village development association, and the association president is helping with these rug sales. 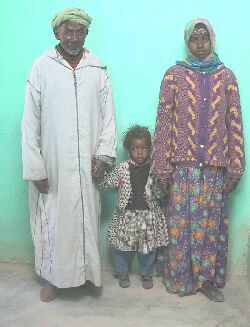 You can learn more about the Near East Foundation at www.neareast.org where Morocco is in the Africa section. 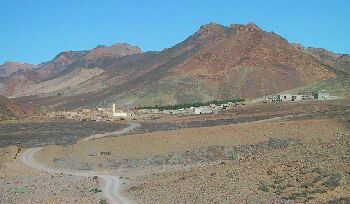 The village of N'kob is near Jbel Siroua, or Siroua Mountain. This is the area with the finest weavers in southern Morocco, and also the finest wool. The wool comes from these sheep and has long fibers, perhaps because of the cold winters. You also see here the natural wool colors. In other breeds of sheep, pure black is very rare. 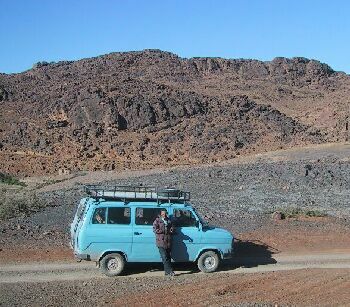 There is no regular transportation to and from N'kob, which is about an hour from Tazenakht, mostly on a dirt road. So to get there and photograph new rugs, I had to get a ride from the Foundation or rent this van and driver. On one trip he delivered me at 9 AM, and came back at 4 when I asked him to. However, there was lots of enthusiasm and many more rugs than I expected, and we didn't finish until 8 PM. If you notice a dark background in some of the photos - that's why! 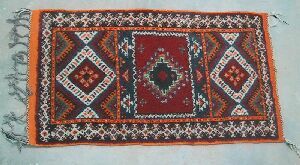 Another part of my plan was to train literate young women to photograph and measure the rugs their aunts or mothers weave, to check email for orders on the internet, and to take rugs that are purchased to town for shipping. However, when I asked if there were such young women in N'kob last fall, I was told there might be one or two, but they weren't present that day. On another trip I met the most educated young woman in the village, but all those tasks were too much for her. Instead, the President of the N'kob Development Association, Si Brahim shown here, helps me with weight and measurements and accepts orders and take the rugs into town for shipping, and pays the women. For now I handle orders through my web site, and convey them to Si Brahim by calling him on his cell phone. We were also helped by the first school principal, Mr. Ait Etaleb, who generously allowed us to photograph rugs at his primary school. You'll see parts of schoolrooms and some students in the photos, including this one. Calling in orders on the cell phone is harder than it sounds. 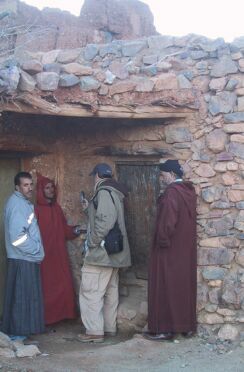 That is because N'kob is in the mountains and the phone network does not reach much of the village. A school teacher walked around the village trying to find a point where his phone would connect, and found the spot shown here in the doorway of an abandoned house. Before that, Si Brahim had to go outside town to a high rock to make or receive calls. I still need to make an appointment to call, since if he is at home, his phone will not connect - he has to be at this spot. Click on the photo to see the wider setting. The young woman on the right is Fadma, photographed with her father and her niece. She is 19 years old and made the small rug below with her older sister in about 20 days. With the money she earns from it she plans to buy gold, which is a common way to save money - especially when there is no bank in town.